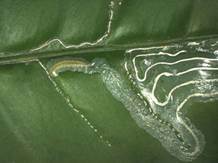 The citrus leafminer is a potentially serious pest of citrus and some related ornamental plants. Originating in Asia, the citrus leafminer was first discovered in Florida in 1993. It has white and silvery iridescent scales on the forewings, with several black and tan markings, plus a black spot on each wingtip. Leafminer populations decline to their lowest levels during the winter because of cool temperatures and the lack of flush for larval development. Populations of leafminer build rapidly on the spring flush, although their presence is not apparent until late spring as populations increase while the amount of new foliage decreases. Usually only one leaf mine is present per leaf but heavy infestations may have two or three mines per leaf, and up to nine mines on large leaves have been found in Florida. 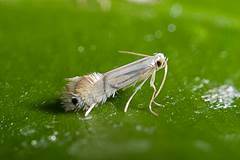 Adults of the citrus leaf miner are tiny moths that hide within the canopy during the day and emerge at night to lay eggs. Larvae of the citrus leafminer form serpentine mines in the tender new flush leaves of all varieties of citrus. The mining causes the new flush to twist and curl and prevents it from expanding fully. The damage is only cosmetic and the infestation will not affect fruit. This insect is not a vector of the disease. Nevertheless, leafminer tunnels are susceptible to infection much longer than mechanical wounds. On healthy citrus trees with leaf miner damaged leaves, these leaves are more likely to become sites for new canker infection. On young trees, use of the soil-applied neonicotinoid insecticides is the most effective means of preventing mining damage on the new flush and has little direct effect on natural enemies. Soil drenches directly to the base of the tree with neonicotinoids have been shown to be most effective. Most control of the leaf minor is being done using chemical control. Leaf minor traps are only effective in detecting the initiation of the first male flight. Because leaf miners are inside the leaf, sprays do NOT kill them. Management of leaf minor is also difficult because female moths prefer to lay their eggs in the lower inside canopy and it is difficult to cover this area adequately with a foliar application spray. If you are seeing leaf minors on your plants, Collier Pest Control can rid you of these damaging insects. We use a systemic soil injection method to let the plant absorb protective materials and not only kill off leaf minors, but any other damaging insect eating on the plant. This method of protection is safe to the plant and lasts for many months. If you live in Naples, Bonita Springs, Fort Myers, or anywhere in Southwest Florida and are seeing leaf minors on your plants, call 239-455-4300 Collier Pest Control for a full explanation on our treatment to protect plants from damaging insects, or look us up on our website at collierpestcontrol.com. Remember Florida does not have to be shared with insects.